The foremost among the devotional hymns available today on Lord Murukan are most definitely those rendered by Saint Arunagirinatha who lived six centuries ago. These include the uniquely structured Tiruppukal songs also called cantappātal because of their built-in varying rhythms. These Tiruppukal stanzas are a peculiar form of melodious versification. The verses are so amenable to various forms of time measure (tālam) that the 1,300 stanzas now in print are in 1008 forms of cantam (rhythm). Until about a hundred years ago, most of these songs were scattered in manuscript form on palm leaves. It was Śrī V.T. Subramania Pillai (V.T.S) who was privileged to gather and compile in a book form as many as 1300 songs out of the 16,000 presumably composed by Arunagirinatha. Śrī V.T.S made it his life's sole mission to collect at least a thousand songs and have them published. This article is a brief description of the man V.T. Subramania Pillai and how he, with the grace of the Lord, fulfilled his mission. This article is based on the biographical work entitled Tiruppukal patippāciriyar Varalāru by my father Dr. V.S. Chengalvarayan, the second son of Sri.V.T.S. This book was written first in 1921 included his personal knowledge of V.T.S. as well as excerpts from the diary of V.T.S. In the introduction he writes that the biography of V.T.S vindicates the adages `follow a virtuous path,' `Trying leads to success' and emphasizes that those who believe in God are never let down. V.T.  Subramania Pillai was born in a family of devoted servants of Lord Murukan in Chingleput on 11 December 1846 to Śrī Tanikachalam and Smt Lakkumi Ammal, of Rishi Karuneegar sect and Gautama gotra. It was a Friday and the star was Uttira. His grandfather Karpagam Pillai was an ardent devotee of Lord Murukan at Tiruttani and it is said that Lord Murukan had guided him through dreams on several occasions. He started his education in 1857 in Chingleput Mission School. Lack of funds for further studies saw him as teacher in the same school on a salary of Rs.8/- in 1863. On the advice of Mr. Miller, a professor in Chennai, (who remained a well wisher of V.T.S. throughout his life), V.T.S. continued his studies in Chennai after topping the Mackintosh Scholarship examination. He completed F.A. and became a teacher in Mr. Miller's school on a salary of Rs.40/-. Due to health problems V.T.S. wished to move out of Chennai. Moreover, teaching was not his choice. Whenever he visited his parents in Chenglepet, he had to walk the entire distance of 35 miles, because there was no rail in those days and his poverty did not allow him to hire a vehicle. At that time, Judge Hudson of Manjakuppam (Cuddalore), impressed by the hand-writing of V.T.S, offered him the second English Writer's post in his court in 1870. Thereupon he passed all the examinations to qualify for the post of a district munsif. After a long wait of eight years, he was appointed munsif of Cuddalore. Subsequently he moved to different places such a Tiruvallur, Namakkal (1888), Kumbakonam (1892), Tirutarupoondi (1894), Madurai (1897) and Manamadurai (1899) and retired in the year 1901. V.T. Subramania Pillai was from his early days very devoted to Tamil and the Tamil God Murukan. Wherever his job took him, he made it a point to visit as many temples nearby as possible. He had visited 176 out of the 274 pātal perrat talankal, which are holy places whose glory has been sung by the great saints Tirujñānasampantar, Tirunāvukkarasu and Sundarar as early as the 7th century. His wish however was to spend his last days in Kanchipuram worshipping Śrī Ekāmbanātha. He, like his ancestors, had a special devotion to the Lord of Tiruttani. Right from the days of his grandfather it was a custom that on Krttikā (star) days, only Tiruttani temple can be visited if at all. This is in practice to this day. This is possibly to indicate the strength of unidirectional concentration. He was regular in his diary keeping which he started on 15 September 1864 at the age of 17 ; maintaining an account book; visiting specific temples on specifics days ; daily prayers which included Śivapuranam, Śiva kavacam, Kandaranubhuti, Saiva patikam; writing Tanikaiyyān tunai 32 times and composing a verse on Tanikēsan every day. Thus a firm faith in the Lord and the habit of thanking him all the time seem to be characteristic of VTS, as seen from his diary. As his condition improved from dire poverty to one of comfort, he increased his services to temples such as making arrangements for lighting of lamps on regular basis, donating utensils, bells etc., for temple use, renovating temples, and helping installation of deities so far unattended. Further, he helped complete the construction of the Rishi Karunīkar mutt in Tiruttani in 1902. In 1905 he took the initiative to re-establish Palamutircōlai, one of the six places of importance to Lord Murukan. He was married to Dayammal on 25 June1868 who shared his devotion to Lord Murukan and remined a perfect companion to V.T.S. in his spiritual journey. In short, the life of V.T.S. can be described by the three Ds: Discipline, Devotion and Dharman. He attained the Lord's feet on 17 April1909 after seeing his life's mission successfully completed by the Lord's grace. In 1871, when V.T.S. was working in the district court at Manjakuppam, dikshitars (priests) of Chidambaram temple, by way of evidence in a court case presented quotations from several literaty works. One such quotation included lines from the Tiruppugal (625). mēnmai vētiyar mikavē pūcanai purikōvē. The beauty inherent in these lines fascinated V.T.S. so much that he made it his life's mission to collect and publish at least one thousand of the 16,000 songs believed to have been composed by Arunagirinatha. It is little wonder that V.T.S felt that the world should get the same joy that he derived. Tānperra inpam peruka ivvaiyakam. Being an ardent devotee of Lord Murukan, he rightly thought that the Tiruppukal songs were the prime pieces of adoration of Lord Murukan just as Tēvāram and Tiruvācakam were considered as best suited for prayers to Lord Śiva. In January 1876, he found six songs of Tiruppukal in the second volume of Arumuka Navalar's Caiva Vinā vitai. In April, on a Good Friday morning, he started copying the songs from palm leaves collected. On June 28th 1878, he obtained 750 songs on palm leaves from Annamalai Pillai of Kanchipuram, and on September 30th a further 400 songs from Sreenivasa Pillai of Pinnatur near Chidambaram. On 20th March 1881 Arumuga Iyer of Karunkuli gave him 900 more songs. In 1903 palm leaves containing 780 songs were found from Tirumakaral, which had just one new song. It was a difficult task to wade through and organize his collection because of repetitions of songs, and variations in the text. In his effort to rectify the errors to the extent possible, Tamil scholars Śiva Chidambara Mudaliar of Cuddalore, Salem Saravana Pillai and Anantarama Iyer were of immense help. In spite of all this, V.T.S in the introduction to the first print requested the public to bear with any errors in the text, hoping to get the text perfected in subsequent editions. This indicates his sole desire to bring out the perfect poetic form of Tiruppukal. He also thanked profusely all those who contributed in the great task of collecting the Tiruppukal hymns. The Tamil world is indeed indebted to those kind souls! The songs pertaining to the six places Ārupataivītu were placed first followed by Pañcabhūta sthalas. The remaining songs were grouped under Tontai Natu, Cola Natu etc. Songs not pertaining to any particular place were arranged towards the end. In 1895 the publication of the first volume of Tiruppukal was released with 603 songs. The second edition was brought out in 1909 after a fair amount of rechecking and revising. The third edition in June 1921 was the effort of his sons V.S. Shanmugham and V.S. Chengalvaran, in which some new songs were added. The fourth edition of Junce 1931 included the literary work Tiruppukal Cirappu Pāyiram. The second volume was printed in 1902. It contained songs of Pañcabhūta sthalas and 158 songs of places from Kasi to Rameswaram. The second edition was brought out in 1923 by his sons V.S.S. and V.S.C. Thirty-two new songs were included in this edition. Although V.T.S. did not live to see the publication of the third volume, he did most of the spade work. In 1926 this volume was published containing 309 Tiruppukal songs and other works of Saint Arunagirinatha including Kantar Anupūti, Kantar Alankāram, Kantar Antāti and Tiruvākuppu. A research write-up on canta (rythm), a biographical note on Saint Arunagirinatha, hymns of praise of the saint, and analytical research notes on the saint's works also found a place in the publication. Tiruvelukūrrirukkai was excluded by V.T.S as he suspected possible imperfections. However his sons, impressed by the flow and content of the song, ventured to include it in the third volume. Incidentally, his son V.S.C, who had inherited the same love for Tiruppukal, made further contributions by presenting Murukan Vēl Panniry Tirumurai along the same lines as Saiva Tirumurais, wherein the meanings and commentaries for all of Arunagirinatha's works are elucidated. This was published in six volumes during 1952-57. The twelth Tirumurai (corresponding to Periyappurānam) called Ceytontar Purānam was composed by Tenur Cokkalingam Pillai. 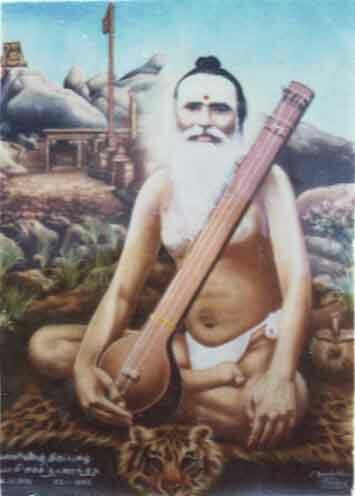 It was Śrī Vallimalai Saccidananda Swamigal (1870-1951) who was chosen by divine will to popularize the Tiruppukal songs. Just like V.T.S., Vallimalai Saccidananda Swamigal, attracted by the beauty of a song at Palani, managed to get the first volume published by VJS and started singing these songs. He met V.S.C at Tiruttani temple in 1912 and this led to a life-long friendship. Swamigal selected a series of songs for use during the various steps of a routine daily worship. For spreading it on a large scale, the pati vilā (step festival) on the 1st of January of every year, was started in Tiruttani in 1918. From 1882, V.T.S was collecting details about Śiva temples with a view to prepare a directory-like book Śiva Sthala Agarati. However his wish was fulfilled after a long interval of 23 years. It was Mahāmahopatiyya Dr.U.V. Swaminatha Iyer who suggested the title Śivasthala Mañjari. Pūvarum amalan, ayilkarac cevvēl ponnati yēninain turkit Tāvarum aruna kiripperun kaviñan cārriya Tiruppukal palavum Mēvaru nilaiyai unarntavan arulē meyttunai yākkotu tēti Yāvarum peraccey cuppiramaniya ēntalcīr iyampurar pārrō! Anvananda, Swami. Saint Arunagirinatha (Madras: Pongi Publications) 1975 pp. 144 + XII. Cengalvaraya Pillai, Va.Cu. Tiruppukal patippāciriyar Va.Ta. Subramania Pillai Carittiramum Avar Iyarriya Tanip Pātalkalum (Madras: P.R. Ramayyar Company) 1921 pp. 138. Va. Su. Chengalvaraya Pillai, "Tiru va.ta. Subramana Pillai ...Valkkai Varalārruccurukkam" in Śrī Vallimalai Tiruppugal Saccidananda Swami Centenary Jayanthi Souvenir, (Madras 1970), pp. 49-57. Gnanapurani Madhavanath, M.A., M.S.is the grand-daughter of V.T. Subramania Pillai and daughter of V.S. 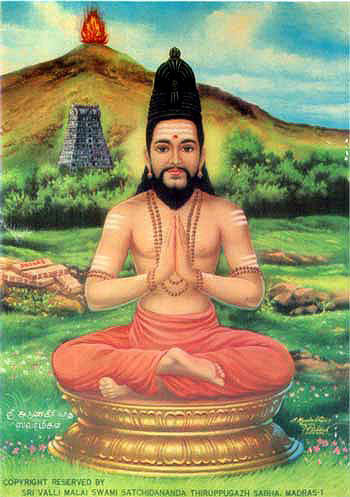 Chengalvarayan, compilers and publishers of Arunakirinatar's Tiruppukal.